The leading contributor to Northern Renaissance art in England, between the years 1526 and 1543, Holbein was one of the few Old Masters to establish himself at the English royal court, setting a precedent for the likes of Anthony Van Dyck (1599-1641) and others. Holbein's presence in England was due to the spread of Lutheranism across Germany, Scandinavia and Switzerland, and the consequent fall in demand for fine art painting. In this climate, many Northern Renaissance artists had little choice but to travel in order to find work. In 1532, Holbein himself went to London where fortunately, due to his earlier visit (1526-28), he was already recognized as one of the best portrait artists of the day. Apart from a couple of short return trips to Basel, he would remain in England until his death from plague at the age of 45. During his previous stay he had worked under the patronage of Sir Thomas More, but now things were different: Henry VIII was about to anull his marriage to Catherine of Aragon and marry his new fancy, Anne Boleyn. Since opponents of such a move included Holbein's former patron, who resigned as Lord Chancellor in May 1532, Holbein had no choice but to distance himself from More, and instead develop contacts with Henry's influential advisor Thomas Cromwell and the powerful Boleyn family. This he did, and in 1535 he became Painter to King Henry VIII. It is because of his portrait paintings of the Tudor royal family and other nobles of the court, that we have a pictorial chronicle of the years when Henry was battling for supremacy with the English church. Unfortunately there are no surviving portraits of Anne Boleyn by Holbein - she became a 'non-person' after her execution in 1536 - but he is known to have made portraits of her as well several of her ladies-in-waiting, including Jane Parker, her sister-in-law. Thomas Cromwell was a lawyer who rose to power under the wing of Cardinal Wolsey. After Wolsey's downfall, he became a willing functionary of Henry VIII, facilitating the king's schemes - including the Dissolution of the Monasteries - in a number of ever more powerful roles, including Lord Chancellor. A shrewd operator, he commissioned Holbein to produce a variety of Protestant Reformation art - including anti-Catholic woodcuts and an illustration for the title page of Coverdale's English translation of the bible. Cromwell's own downfall came about when he fell out with Henry after advising him to marry Anne of Cleves. It was an unpopular move, and Henry refused to consummate the marriage (allegedly) because of Anne's looks. Cromwell's blunder gave his many enemies the chance to topple him, and secure his execution. Holbein - whose flattering Portrait of Anne of Cleves (1539, Louvre, Paris) was instrumental in misleading the king as to Anne's marital suitability - never recovered from the loss of patronage following Cromwell's death. 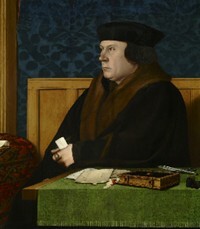 Holbein's Portrait of Thomas Cromwell, is a smaller than usual panel painting, which was painted when the sitter was about 48. It is one of two portraits which Holbein completed of Cromwell; the second is a circular picture, part of a series of medallions of Tudor statesmen and courtiers. The picture was painted in the early years of Holbein's second visit to England, when Cromwell was beginning to acquire serious influence at court. He had also become a key patron of Holbein's career as an artist. In the portrait, he is presented as a man of solidity and substance, albeit with a certain dourness and rigidity. He is shown looking off to the left, almost in profile. There is a wariness and a severity about him. The portrait has been described by one of Holbein's "most viciously mocking works" but this is a gross exaggeration. Cromwell was still hiding his ambition from his rivals and probably preferred to be seen as an dull individual, with restless eyes and a cruel mouth. Holbein presents him seated on a plain wooden bench behind a table. From the legal document which he is clutching tightly in his left hand, it is clear that he is a lawyer. He is dressed in a black fur lined coat, and a black hat. His only noticeable personal adornment is a gold ring with a large green gemstone. Otherwise his clothes offer no clue as to the personality of their wearer. The table is neatly covered with a fairly ordinary green cloth, bearing a few of his personal effects, including a quill, a bible or prayer book, some scissors and a leather bag. This is a serious man, with a concentrated focus, and no time for distractions. The sense of his unreachability is subtly enhanced by placing him relatively deep in the pictorial space, creating extra distance between him and the viewer. The dark colours, plain furnishings, lack of adornment or patternwork of any kind, add to the gloominess of the room, and the complete absense of human warmth, to create a feeling of austerity and Protestant self-denial. It is, one feels, precisely the sort of portrait that Cromwell would commission for himself. It is believed that the original of the portrait was destroyed in the aftermath of Cromwell's disgrace and execution, since no mention is made of it in any later royal inventory. As a result, according to art historian and curator Sir Roy Strong (b.1935), the three surviving versions of it - now in the Frick Collection, New York; the National Portrait Gallery, London; and the Chichester Constable Collection, Yorkshire - must be copies by lesser artists, probably from Holbein's workshop. However, following X-ray analysis of the Frick version of the portrait, art historian John Rowlands is of the opinion that the Frick version shows the hand of Holbein and is the original portrait. The debate continues. Note: Other paintings completed by Holbein around this time include: Portrait of a Woman in a White Coif (1532-4, Detroit Institute of Arts); Derich Born (1533, Royal Collection, Windsor Castle); George Nevill, 5th Baron Bergavenny (miniature) (153235, Duke of Buccleuch collection); Dirk Tybis (1533, Kunsthistorisches Museum, Vienna); Cyriacus Kale (1533, Herzog Anton Ulrich Museum, Braunschweig); and Hans of Antwerp (1533, National Portrait Gallery, London).  For more outstanding Northern Renaissance paintings, see: Homepage.